The Savannah River Basin is located in eastern Georgia and western South Carolina and defines the state boundary between Georgia and South Carolina. The Chattooga and Tallulah Rivers join in the Savannah River headwaters to form the Tugaloo River. Further downstream near Hartwell, the Tugaloo River joins with the Seneca River from South Carolina to form the Savannah River. From here, the Savannah River flows southeasterly to the Atlantic Ocean. The Chattooga River is one of the longest and largest free-flowing mountain streams in the Southeast, and on May 10, 1974, Congress designated the Chattooga River a Wild and Scenic River. The Savanna River Basin is 10,577 square miles: 5,821 square miles in eastern Georgia, 4,581 square miles in western South Carolina and 175 square miles in southwestern North Carolina. The Nature Conservancy of Georgia describes the Savannah River Basin’s abundant diversity of life as rivaling that of a South American rain forest. The Savannah River Basin is home to more than 75 species of rare plants and animals, including the majestic swallow-tailed kite, the rocky shoals spider lily, and the wild cocoa tree. On river bluffs near Augusta, such rare plants as bottle-brush buckeye, false rue anemone, and relict trillium can be found. There are 108 fish species representing 36 families. The Georgia Department of Natural Resources stocks approximately 203,200 catchable trout in 14 streams in the basin. There are 18 federally-listed species in the Savannah River Basin – five are federally threatened and 13 are federally-endangered. In addition, there are 55 species that are either state-listed or of special concern. 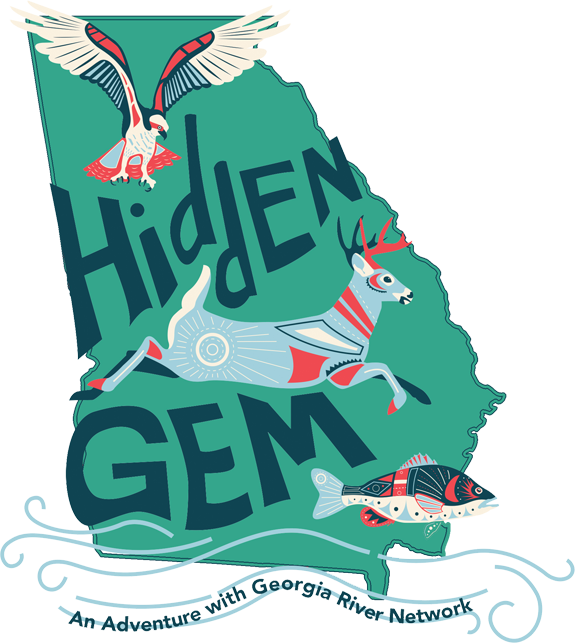 The state-endangered Robust Redhorse, once thought to be extinct, was found in the Savannah River shoals in 1997. Prior to 1997, the Oconee River Basin had the only known native population of this endangered sucker. Robust Redhorse stockings are currently directed at the Broad River, a major tributary of the Savannah River. Only about 3,000 federally-endangered shortnose sturgeon are known to exist in the Savannah River. The state-listed endangered Shoals Spider Lily grows in the shoals of the Broad River in Elbert, Wilkes, and Lincoln Counties. It can also be found in the shoals in the Savannah River near Augusta, in Stevens Creek and in the Catawba River near Charlotte. A diversity of reptiles and amphibians lives in the Savannah River Basin, including the American alligator; nonpoisonous snakes like the coachwhip, rat, rough green, and speckled king; poisonous snakes like the eastern cottonmouths, rattlesnake, and southern copperhead; several species of frogs and turtles; and numerous species of lizards and salamanders, including the endangered flatwoods salamander and striped newt. Forestry represents a major part of the economy in the Savannah River Basin, with approximately 2.4 million acres of commercial forest land. Agricultural practices in the basin include animal operations and commodity production. Generally, animal operations are concentrated north of the Fall Line and commodity production is concentrated south of the Fall Line. Georgia Power Company operates its fossil-fueled Plants Kraft and McIntosh by withdrawing water from the Savannah River in the Savannah River Basin. Southern Nuclear Operating Company operates its nuclear Plant Vogtle by withdrawing water from the Savanah River in the Savannah River Basin. NPDES Discharges: As of 2018, there are 177 facilities, including industries and municipalities, authorized to discharge wastewater basin pursuant to NPDES permits. The Savannah River also supplies water for the Savannah River Site, which includes the Savannah River Ecology Laboratory, in South Carolina. On the coast, the Savannah River is the shipping channel for the Port of Savannah, the nation’s tenth-busiest port for oceangoing container ships. The harbor and ship channel will be dredged so ships can use the harbor regardless of high/low tide cycles. The Middle Savannah River supplies outfalls for chemical plants and other facilities that discharge treated wastes into the river. As of 2018, the EPD had issued 536 agricultural water withdrawal permits in the Savannah River Basin. Between 1911 and 1927, Georgia Power constructed 6 dams across the Tallulah and Tugaloo rivers to generate electricity. These plants comprise Georgia Power’s North Georgia Hydro Group.Between 1966 and 1973, Duke Energy constructed 2 dams across the Jocassee, Keowee and Seneca Rivers to generate electricity.The major impoundments in the basin are Hartwell Lake, Richard B. Russell Lake, and Clarks Hill Lake, all managed by the U.S. Army Corps of Engineers. Hartwell Lake is a 56,000-acre reservoir located at the confluence of Tugaloo River and Seneca River. Richard B. Russell Lake is a 26,000 acre reservoir just downstream from Hartwell Lake. Clarks Hill Lake 70,000 acres, and is on the Savannah River northwest of Augusta. When these impoundments are all at full pool, there is only one mile of free flowing river between the upper reaches of Lake Hartwell and Clarks Hill Dam, about 80 miles downstream. The Stevens Creek lock and dam above Augusta was constructed in 1925, and is now operated by South Carolina Electric and Gas. The lock does not function. Augusta Canal Diversion Dam and lock was constructed in 1845 to supply water power and drinking water to Augusta. It continues to function today. Savannah Bluff Lock and Dam below Augusta was constructed by the U.S. Army Corps of Engineers in 1937. The lock has fallen into disrepair. A fish passageway has been approved for construction around the lock and dam. NPDES Discharges: As of 2018, there are 177 facilities, including industries and municipalities, authorized to discharge wastewater basin pursuant to NPDES permits.As of 2018, the EPD had issued 536 agricultural water withdrawal permits in the Savannah River Basin. The Savannah River supplies drinking water to Augusta and Savannah, Georgia, and Hilton Head, and Beaufort, SC, and many smaller municipalities in the basin. As salt water intrudes into the aquifers near the coast, the freshwater of the Savannah River becomes even more important as a source of drinking water. The river supplies drinking water to more than 1.5 million people. Augusta Canal: The Augusta Canal’s first level is a 7.5-mile corridor that follows the best-preserved industrial canal of its kind remaining in the South. The Canal’s first level is an easy beginner paddle on moving flatwater with some current. For more information, visit https://www.garivers.org/augusta-canal.html. Broad River Water Trail: The Broad River Water Trail encompasses 75 miles, running from the Hudson River and Middle/Fork Broad River to Bobby Brown State Park. It includes 10 access points and 8 highway bridge crossings. For more information, visit https://www.garivers.org/broad-river-water-trail.html. Chattooga River: 58 miles of the Chattooga River were designated as a Wild and Scenic River in 1974. Wild and scenic designation protects rivers in a free-flowing condition. There are multiple access points along the Wild and Scenic River Corridor. For more information, visit https://www.garivers.org/chattooga-wild-scenic-river.html. Savannah National Wildlife Refuge: Visitors of the refuge can enjoy wildlife viewing, hunting, fishing, and self-guided interpretive exhibits at the Visitor Center. For more information, visit https://www.fws.gov/refuge/savannah/. Watson Mill Bridge State Park contains 1,020 acres and the historic covered bridge, which is on the National Register of Historic Places and was built in 1885. Bartram made a brief incursion into Georgia in June, 1775, before heading south with “a company of adventurers for West Florida”. While they were making preparations for the “long and hazardous…journey,” at Fort Charlotte, South Carolina, Bartram made “little botanical excursions toward the head of the Broad River, in order to collect some curiosities which I had observed.” No doubt Bartram here refers to his surveying trip of two years before, which took him near the Broad River. Click on the name of the group to view additional details in our online group directory. 305(b)/303(d) Listings In the Savannah River Basin, there are approximately 72 rivers and streams listed on the 2012 integrated 305(b)/ 303(d) list as waters not supporting their designated uses. These impaired waters include roughly 526 miles of rivers and streams in the Savannah River Basin. The presence of giant fossilized oyster shells along Shell Bluff, located just south of the fall line in Burke County, is evidence that the fall line formed a coastline some 50 million years ago. The cliff-like face of the bluff is chalk white, due to material weathered from limestone. The naturalist John Bartram, father of William Bartram, visited Shell Bluff in 1765 to study the large shell formation. Archaeologists believe that the Paleoindians first appeared along the Savannah River near the end of the Ice Age, some 12,000 years ago. The first-known European explorer to reach the Savannah was Hernando de Soto in 1540. He and his soldiers crossed the river, probably near what is now Augusta, where the river divided and swept around an island. In the late sixteenth century, the French started the first European commerce on the Savannah, trading with the Indians for sassafras. Sometime during the early seventeenth century, the Westo Indians took up residence along the Savannah. They became allies of the English in South Carolina and acted as a buffer against the Spanish to the south. The English traded guns and cloth with the Indians for furs and deerskins. Colonial settlers discovered that the marshlands around Savannah were ideal for the cultivation of a particular global commodity and staple—rice. However, slavery was prohibited in the colony in 1735, making rice cultivation in Georgia unprofitable. After slavery was legalized in 1750, rice plantations dotted the riverbanks and marshlands, whose waters, fed by the river and the tides, generated significant profits for wealthy Georgia planters until the conclusion of the American Civil War and abolition of slavery.